The campsite at Gully Branch (not shown) was reserved for those who wished to camp the night before and after the paddle. Eight of the paddlers chose to camp: either in tents or in their own cars/truck. A campfire will always draw a circle. The next day, all campers were ready to go before 8:00 and the non-campers arrived soon after, but the van and trailer did not arrive till 1.5 hours later. Kayaks were quickly loaded and the paddlers and their trailers shuttled to put-in on FR 22, 10 miles east of Sumatra for the day’s 16.6 mile paddle. The tree below fell perfectly, leaving ample space, but this was not often the case. Lunch was eaten ravenously while resting on a small hammock. And the group continued its paddle. 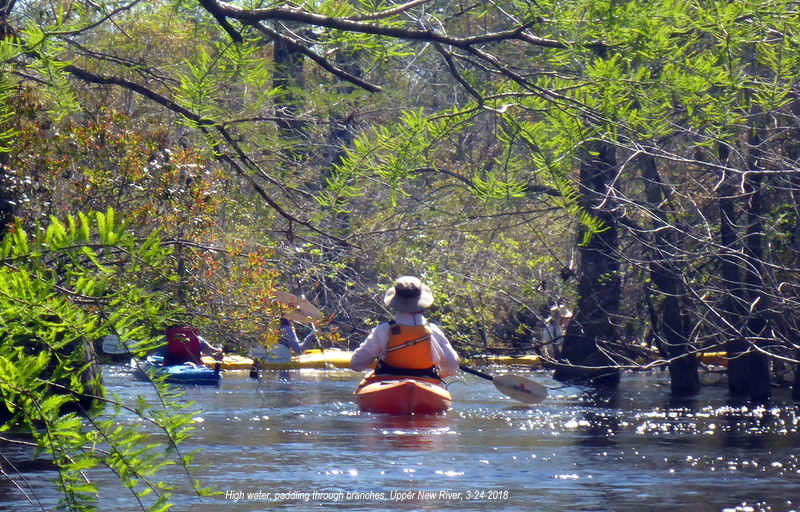 This entry was posted in New River, Paddling Tate's Hell State Forest, Tate's Hell State Forest, Tate's Hell State Forest camping and tagged New River, Paddling Tate's Hell State Forest, Tate's Hell State Forest on March 26, 2018 by marylynanded. 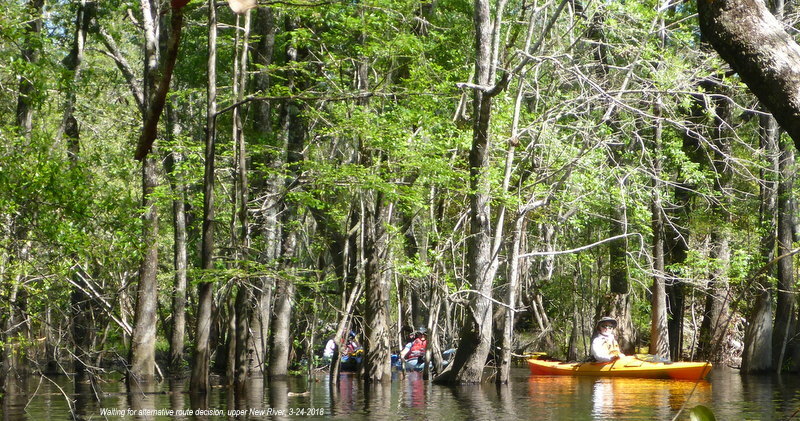 The New River was 48 inches higher than 6 days prior, when a crew of three scouted it in preparation for an Apalachee Canoe and Kayak Club trip on Saturday, March 24. Plans were to cancel the trip if the river dropped another foot — that would have created a drag-along situation since the water was barely able to transport the bushwacking crew, even after they had opened channels of debris and removed and cut dangerous obstacles. Since not all paddlers are trekkers, there would have been an unhappy group of paddlers. Scouting/clearing crew work prior to these paddles have attempted to be as minimal in their removal of branches and obstacles as possible, since maintaining the wild nature of the river is the reason paddlers like to paddle the upper stretch. This river can be paddled through only at certain times of the year. Its source of water is through seepage from points north, but also relying on its water to survive are the many trees which line the water. When they begin to leaf, the amount of water consumed by deciduous trees can lower the river as much as 18 inches in 1 week (last year’s experience). 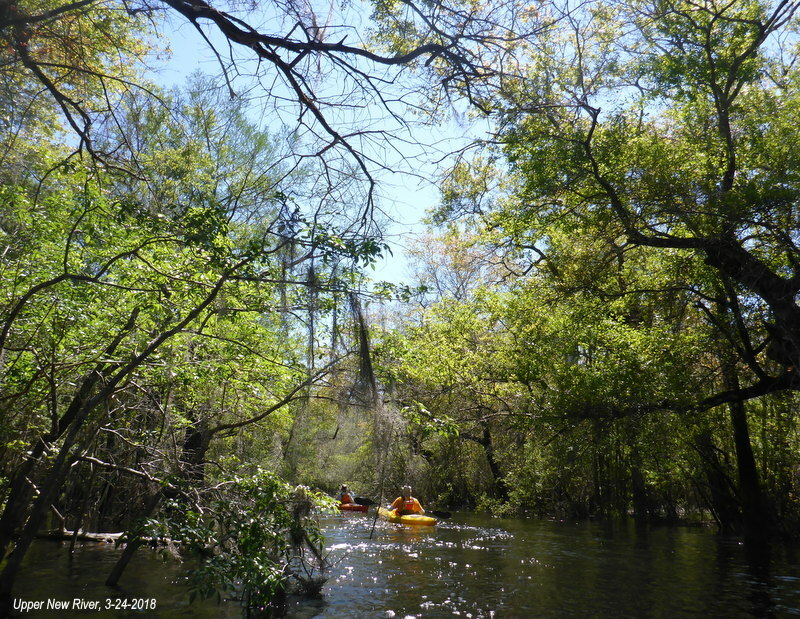 The rule of thumb for paddling that river is go before the deciduous trees start to leaf out. When warmer weather appears, biting flies, unlike mosquitoes, will follow you on water and can have you preferring freezing cold and rain to their pestilence. Flies are particularly pernicious at the Gully Branch landing when the weather turns warm. Successfully paddling the upper sections may require a bit more than basic paddling skills when rushing current chooses the path into fallen trees and debris. 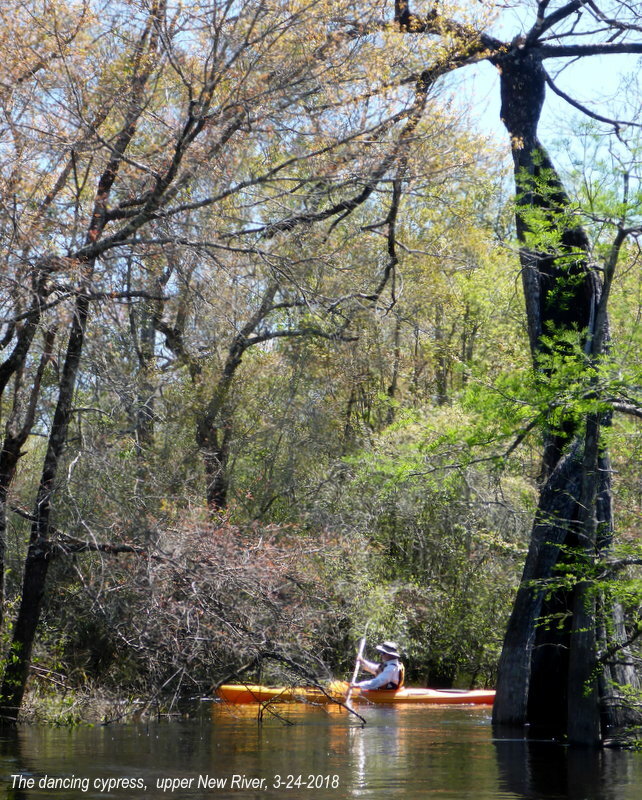 An additional obstacle in high water are the branches which would normally be above a paddler — cuts and scratches are not uncommon then. The cachet of being away from it all is probably as attractive as any of the other reasons. As David Morse, trip leader explained, this upper area is “a small outpost of wilderness … there is no road access from the river for about 7 miles.” Once past campsite 1, about 2 miles from put-in, one is out of easy walking distance to a road until one reaches campsite 17 on the New. 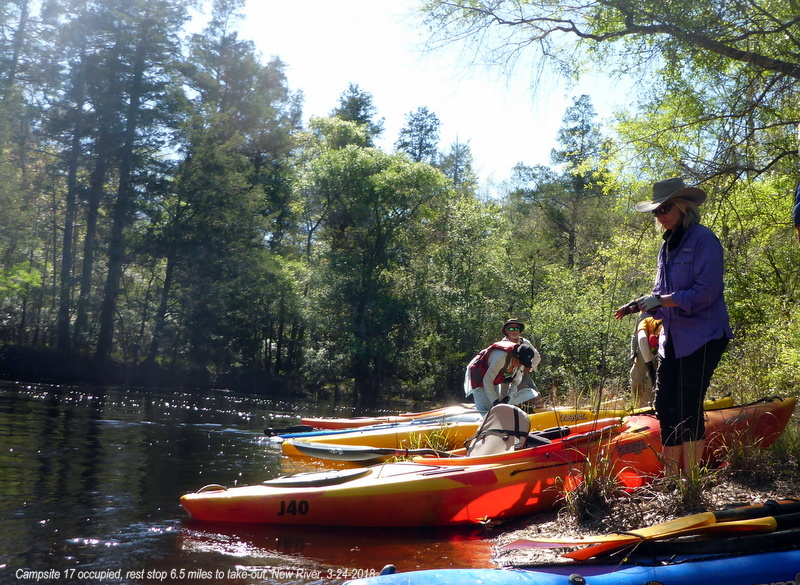 And…the upper 9 miles is a beautiful paddling “trail”. The river can surprise one, however, as it did last year, when the trip in early March was without a single obstacle with a slower water flow. Or as one paddler remarked, “A piece of cake!” to the dismay of one of the organizers who had promised the group challenges. The put-in is a steep, eroding sand path, barely held together by tree roots. 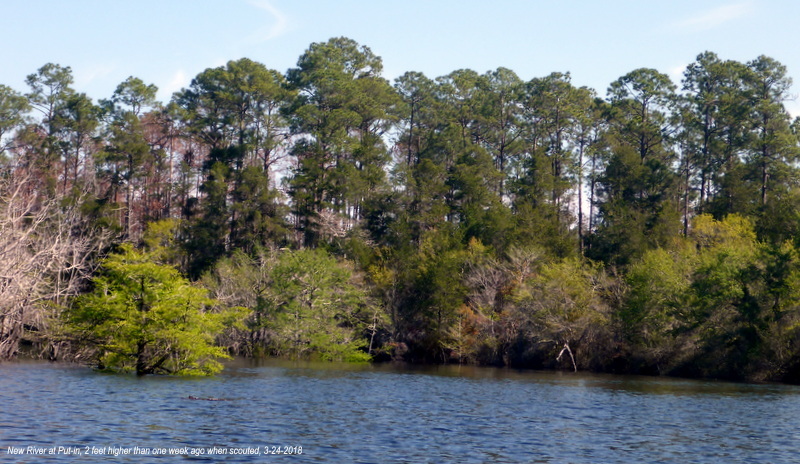 It is off Forestry Road 22, which defines the Apalachicola National Forest and the Federal Mud Swamp Wilderness Area to the north and Tate’s Hell State Forest to the south. About 10 miles east of Sumatra, the sandy forestry road ends at a guardrail. The wooden bridge, which once made getting to the destination easier, was apparently destroyed when fishermen started a fire on a very cold day to warm themselves. Since then, one of the first challenges for paddlers contemplating the New has been the tediously long shuttle. 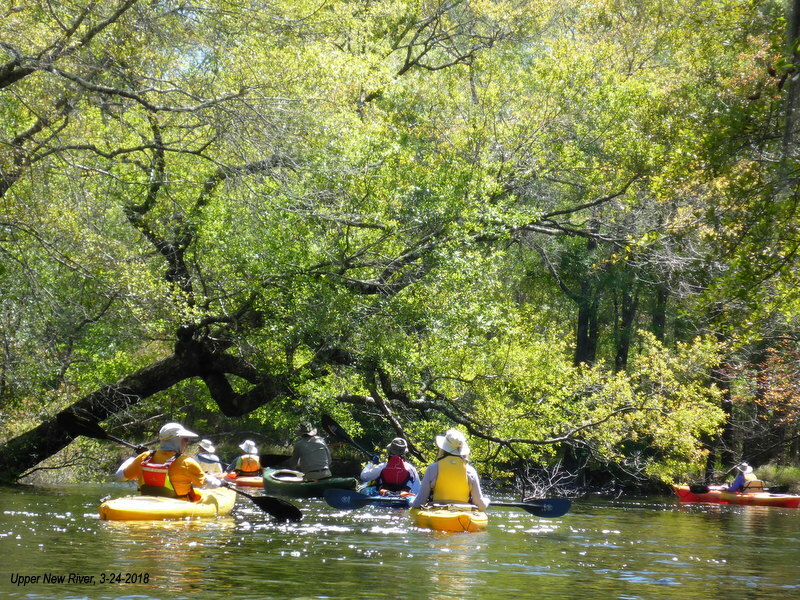 A group of paddlers have been organizing this itinerary annually. The 21mile, 2 day trip, starts at the FR 22 put-in on the west bank of the New and ends at Pope’s Place Campsite also on the west bank. The first day’s paddle of 9 miles takes into account the long shuttling time and possibly longer time on the river depending on conditions and ends for a night camp-over at campsite 17 on the east bank. Campsite 17 has a large sandy area in lower water, and a grassy chute in higher water to accommodate canoes and kayaks and a very large campsite. 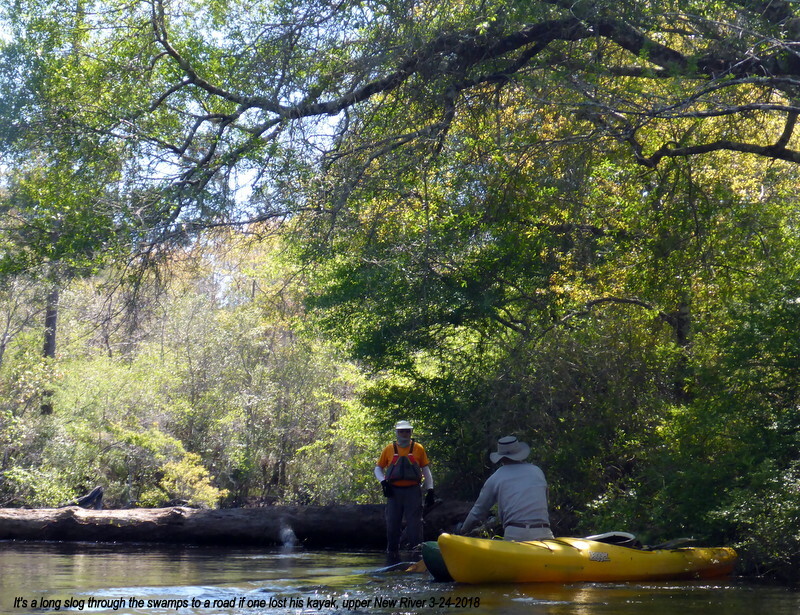 The rest of the trip, about 12 miles of easy paddling, completes the paddle the next day to Pope’s Place campsite which lies upstream from the junction of the New River and the Crooked River. At this point the New becomes the Carrabelle River. 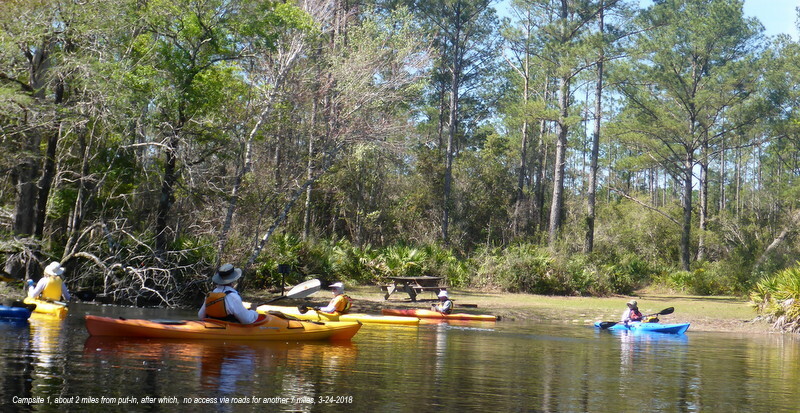 The Crooked River joins the Ochlockonee River to the east and the Carrabelle River to the west, forming an ideal off-coast section of the Florida saltwater Circumnavigational Trail: Gulf of Mexico, Carrabelle River, Crooked River, Ochlockonee River, back to the Gulf. Last year’s paddle continued this 21 mile, 2 day paddle itinerary, except that all paddlers met in Sumatra, drove ten miles east to the put-in with their kayaks, deposited their kayaks at the put-in (with a paddler watching the 14 kayaks) and returned the cars to the final take-out at Pope’s Place Campsite in Tate’s Hell, on the northwest corner of Carrabelle’s city limits. There, an outfitter transported the paddlers back to the put-in and they began their day’s paddle to campsite 17, where the outfitter had also transported all camping and cooking gear for the group. Because of the size of the group, a portable toilet was rented for that site. Since it is a primitive site there is no water, no privy, only table, grill and fire pit. New River campsite 17. 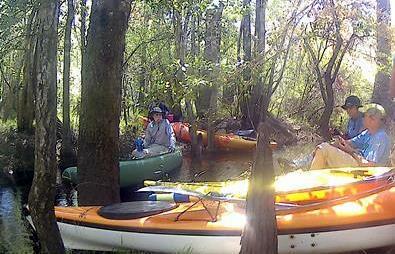 Group of 14 paddlers camped overnight on March 2017 while doing 21 miles of New River. Photo by David Brashears. 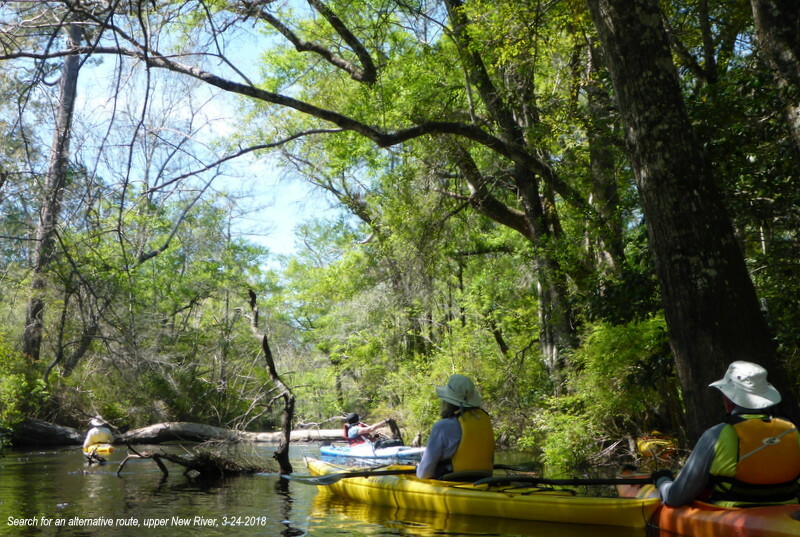 This year to simplify the logistics, a 15 plus mile paddle was planned from the usual put-in, which ended at Gully Branch landing, 6 miles upriver of Pope’s Place Campsite. 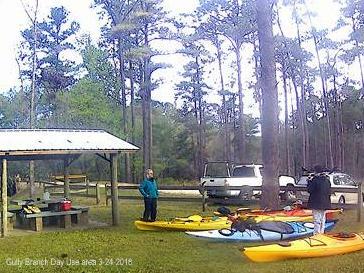 Last year’s group had lunch on the second day of the paddle at the Gully Branch site. No paddle on any river is the same; even more so with the New River. The water can rise and fall within a week and paddling conditions can change radically. The water level can also rise overnight, as one group of tenters found. With that expedition, the tents near the lowest points of the campsite started taking in water when the river rose during the night. A mass evacuation of tents and tenters in the middle of the night to the long road which accesses the campsite cut any hope of a good sleep for that year’s paddlers. Rains upriver in the area of the Mud Swamp Wilderness area are welcome, but if they do come the week before the paddle/tent camp at this site and the river is already high, pitching tents on higher ground is recommended. Anticipating that anything can happen on this river, this year’s planners opted for an 8am meet-up at Gully Branch to give more daylight hours on the river. Arrangements were made for pickup of all kayaks and paddlers by an outfitter which would then transport them to the New River. Cars would remain at the Gully Branch landing where the paddle would end. To ensure that paddlers would get enough sleep for the next day’s paddle, the single Gully Branch campsite was reserved for the night before and the night after the paddle. Five paddlers chose this option and set up 3 tents and three others had sleeping arrangements in their vehicles. Four paddlers chose to spend the night after the paddle at the Gully Branch site. Any arrangements with a private outfitter should consider forestry rules: e.g. no payment for services can be made within the forest. 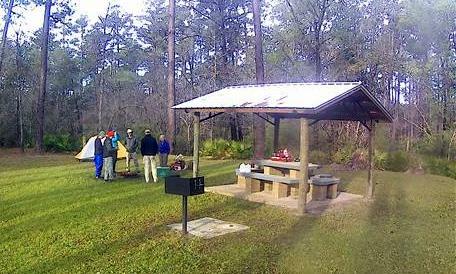 When planning a group trip, organizers might wish to contact the Talquin District Florida Forestry Recreation Coordinator in Tallahassee who has jurisdiction of recreation sites on this particular forest as well as other forests in Leon, Wakulla, Jefferson, Gadsden, Liberty and Franklin counties in north central Florida. The Gully Branch campsite is the smallest in Tate’s Hell SF and can only accommodate one tent easily. 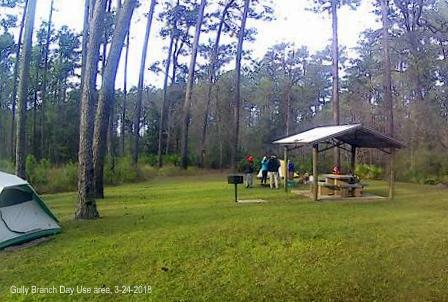 It is recommended that groups camping as we did get a permit for using the adjacent day use space from the Tate’s Hell State Forest office in Carrabelle. Groups using campsite 17 on the river should consider renting a portable toilet (or bringing camp toilets with compostable/disposable individual bags). The forest floor around the campsite is heavily rooted and difficult to dig deep enough holes — 200 feet from water’s edge and has greenbrier vines which can easily trip one at night. Compostable/disposable individual toilet bags have been designed with a tight seal and can be disposed in any waste container. These insert in sit-on-top portable toilets and are easy to remove once used. 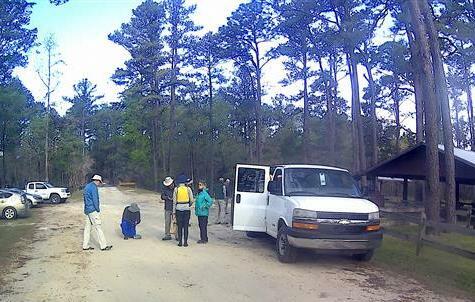 This year, load capacity of the outfitter’s trailer and van determined the number of paddlers on the trip: eleven. This year and last, there was a waiting list. Nature can be unpredictable, but so can logistics. The shuttle van and trailer arrived about 1.5 hours after it was expected because the trailer lights were not working and the van and trailer might have been flagged by the police for driving without lights in the darker early morning hours. These paddlers already knew how to handle the vagaries of natural conditions as wind, rain, and temperature, so accommodating human logistics and frailties was probably easier for them to do than for others whose lives are ruled by the clock and calendar. 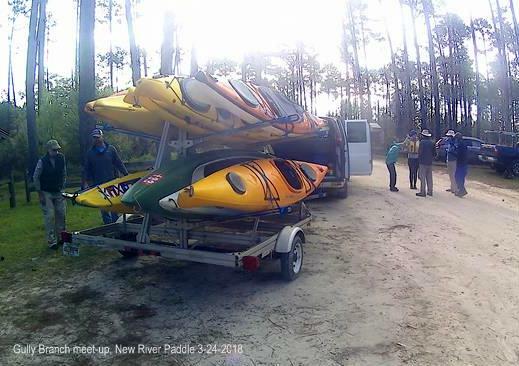 They also know that helping to load and unload kayaks and to carry the boats to the launching place ensure a faster put-in and take-out for all, particularly at this put-in where the steep, root-bound, eroding sand made called for careful footing while lowering kayaks to the river. Where a large expanse of the river frontage was exposed the week before, the higher water made for only a small inclined ledge to get into the boats this time. Put-in, 6 days before, when river was 48 inches lower, photo below. With everyone helping, the group of 11 paddlers were on the river shortly after arriving the at the put-in. 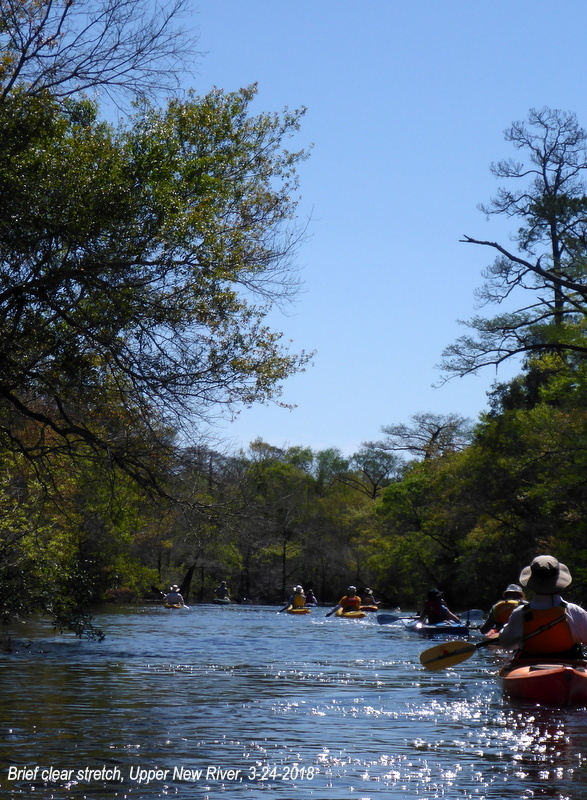 The wide expanse of river shown above was brief, paddlers were soon forced to go single file, avoiding branches which were not obstacles a week before, and which now could entwine and scratch paddlers. 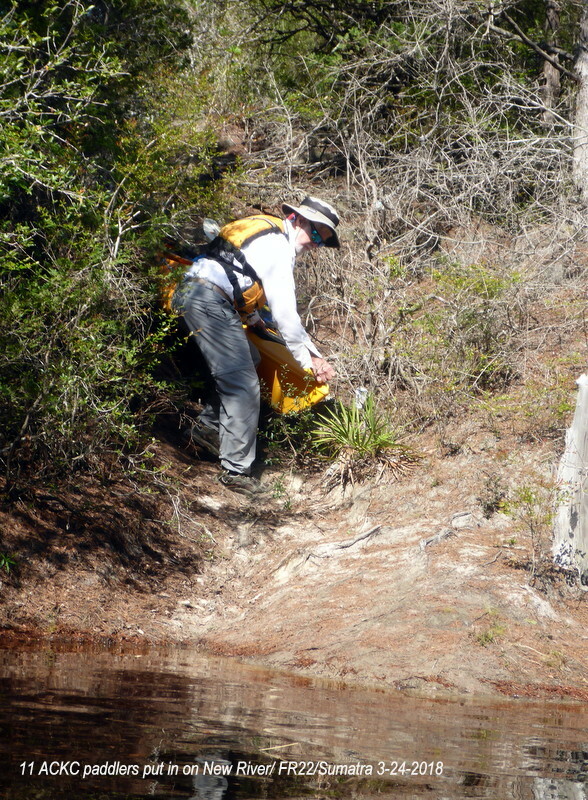 All last week’s bushwacking efforts were underwater, only the memory of the work remained. But the trip leader’s canoe carried cutting and trimming gear required of the new river conditions. 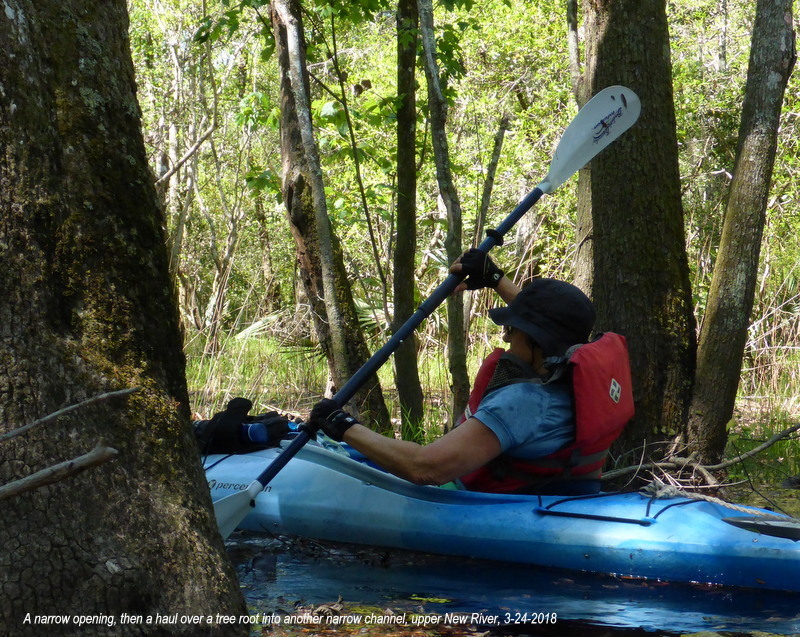 A canoe has a much firmer base to stand up on than a sit-inside kayak, although it still requires careful balancing. 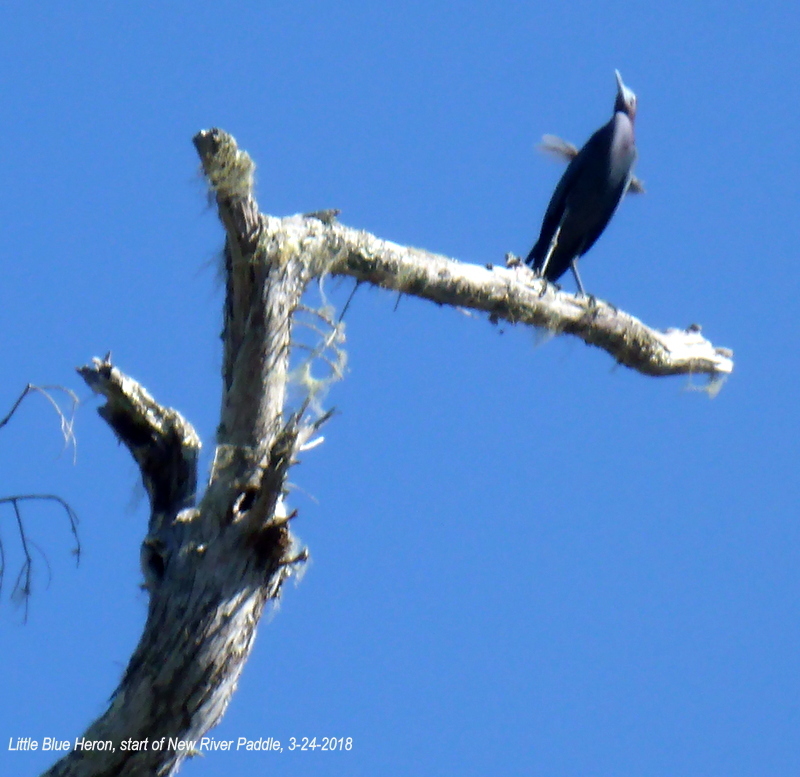 On a dead cypress, a blue heron watched the goings-on below. Two miles from put-in is campsite 1, which normally is on much higher ground, such that it is hard to take-out or put-in under most conditions of water level here. This would make an excellent campsite for paddling the river and a shuttle car could be left here more securely than at the FR 22 put-in, except for sharp drop at river’s edge, most of the time. Four feet of higher water makes a world of difference. This time the whole campsite waterfront was a launching area. The photo below shows how low the New was on January 19, 2018 at campsite 1. What is not visible, is the deep drop at water’s edge. Obstacles not apparent last week, frequently challenged the paddlers. Tree falls under which the scouting party had paddled without thought became major blocks to navigating downstream. 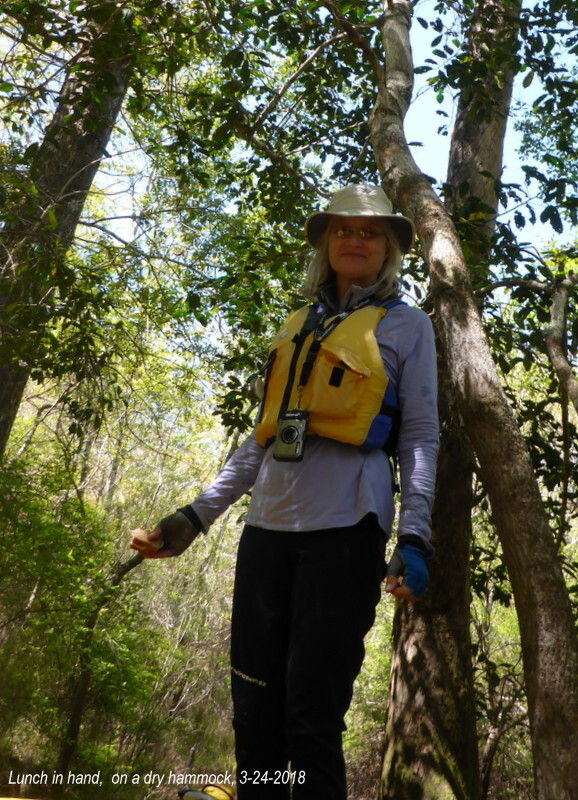 In the above photos, a treefall provided too little space to limbo under and a deep drop downriver from the trunk and no dry land footing on either side of the tree to haul over the kayaks. An alternate trail was found by entering a shallow, narrow area of water which was blocked by a much smaller fallen tree. 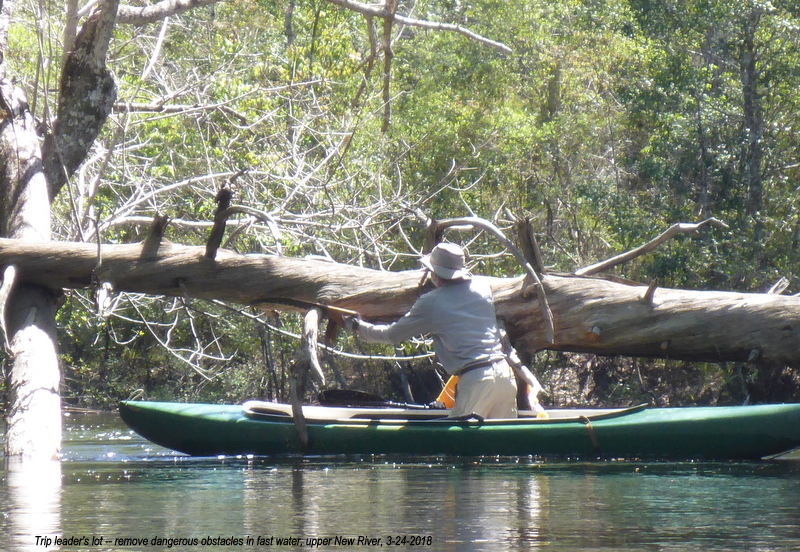 The trip leader hauled each paddler over this small fallen tree with the paddler still in the boat. While capsizing on land is drier than water, the paddlers still had to maintain their balance over this tipsy, bumpy haul over. But credit must also be given to the trip leader, whose strength and ability to get the kayaks (with paddlers in them) fast enough over the small tree prevented dry land capsizes, the forward momentum overcoming the sideways bobble of the paddler. Barriers appeared frequently throughout the first 9 miles. These obstacles, while alternative paths were being analyzed, allowed other paddlers to sit in their kayaks to either contemplate the world around them or engage in bleacher quarter backing. But each paddler had also to encounter his/her barriers individually. Nevertheless, everyone seemed to be enjoying the challenges, the beauty of the paddle and the perfect day we had been given. There were great paddling moments: the feel of the current and using it to accelerate or go with the flow around the bends — a sense of being one with water and land and air. 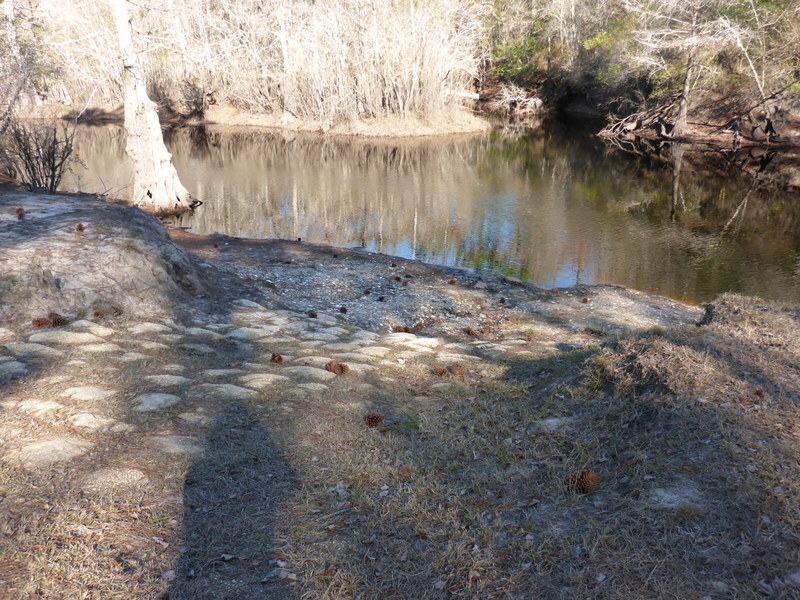 The challenge of strainers is always present in North Florida’s smaller rivers and creeks. 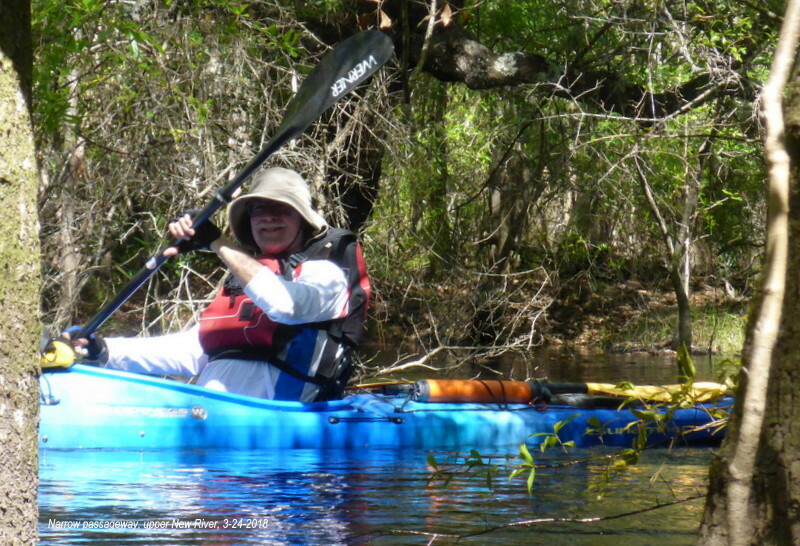 This is what makes the North Florida paddle a test of one’s technical skills. When the current rushes under a mass of branches, leaves and trunks, depending on speed of current, it can provide a challenge and/or a danger. Although the river was running moderately well, it did not post much of a danger — a capsize would probably have been easily righted and the paddler would not have been caught under a spiraling downward underwater current which is always a danger in fast moving rivers. It actually was fun. Anticipating an 8am start, most paddlers had eaten breakfast way before that and were ravenous by the time of the lunch stop, in an off river slough trail, on a small hammock. There were two limbos, but one had branches spaced close enough to pose a danger if the current pushed the paddler away from the intended path, causing a capsize or a gash. Trip leader Morse’ tools were put to good use throughout the day. Below, he had to hold on to the trunk to keep his canoe from floating away with one arm, cutting with his left hand only. Try that — it takes a skill, strength and practice. His loppers also did duty cutting paths through strainers which blocked the whole river. Work like this is easier done from a canoe — one could not do this without chancing capsizing in a sit inside kayak. With two Davids doing duty: one on each side of the log, the paddler approached the log, got out of the kayak on a carpet of leaf over mud and sand and clambered over the big tree while his/her kayak was carried and pushed over the log and then pulled into the downstream waters by the other David who stabilized the boat to enable the paddler to paddle downstream. This was an easy task for the paddlers, but requiring a bit of lifting and hauling on the part of the two Davids — 11 pull-ups weighing probably anywhere from 38 pounds to possibly 50, depending on amount of gear and water the paddler was carrying in the kayaks which were hauled over. 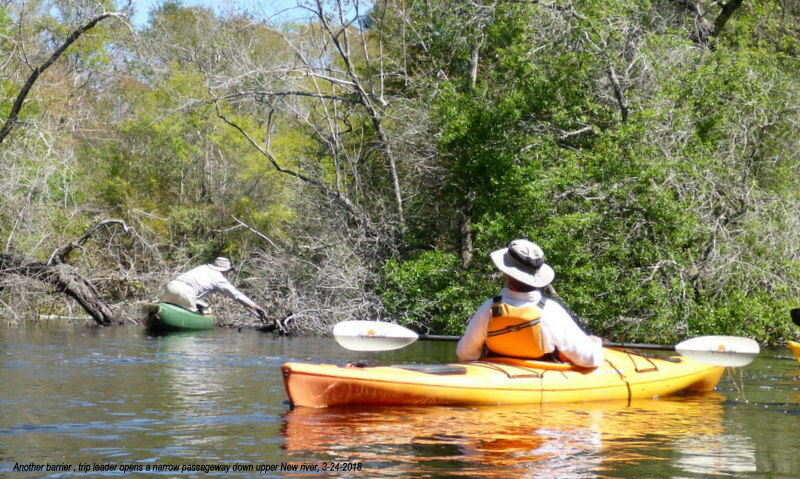 At this fallen tree, soon after the last paddler’s kayak was hauled over and the 9th paddler off down river, the kayak of David the downriver log assistant followed the 9th kayaker down the river, sans David — a paddler-less kayak. It was retrieved and restored to David, not without some paddling finesse on the trip leader’s part. 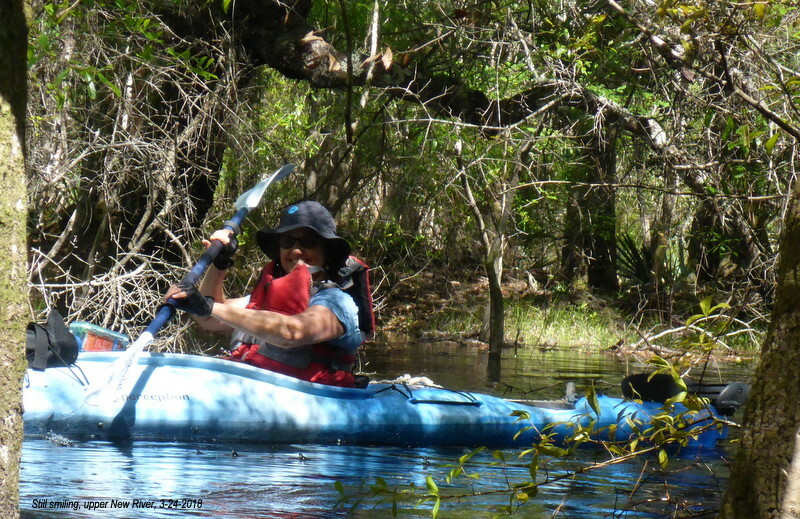 Lacking the recommended rope, holding on to it and paddling with one hand upstream was difficult until David Morse finally found a short strap in his canoe to fasten to the kayak. 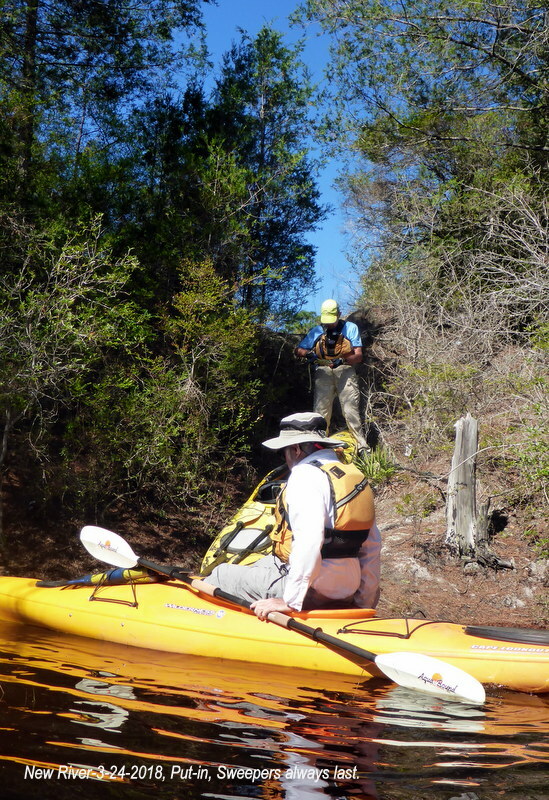 On trips such as this, having an attached rope makes for easier put-in down the steep inclines (and getting out of the river on steep inclines) and easier retrieval of an errant kayak or towing a tired kayaker. Today’s trip on the upper New called for an extra rest stop. This was initially planned for Campsite 17, but it was being occupied by campers, so the group took out on a sandy stretch just upstream from it — a short break. 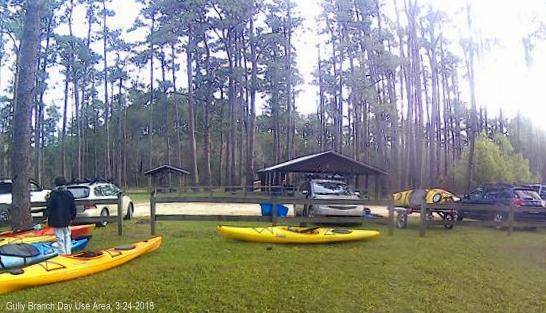 According to the previous Recreation Director of Lake Talquin District, Marti Miller, campers should be aware that paddlers have a right to land or launch at these sites. With a group as large as ours, the choice made by our trip leader was considerate of the campers since we did have a satisfactory resting place. Downriver of campsite 17, the remaining river was an easy paddle, without any obstructions, allowing each paddler to set his/her own pace. Along the banks, the golden club plant in bloom were partly submerged. 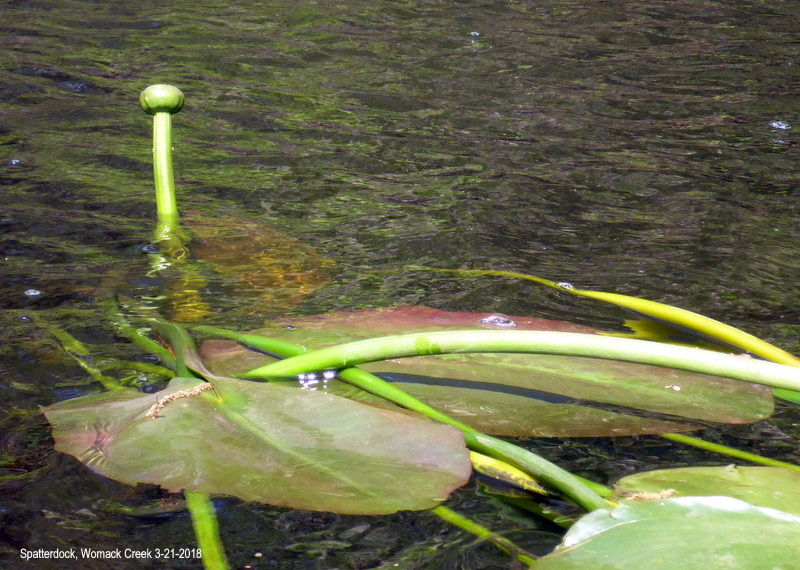 Swamp lilies should be blooming in three weeks, a bit late this year. 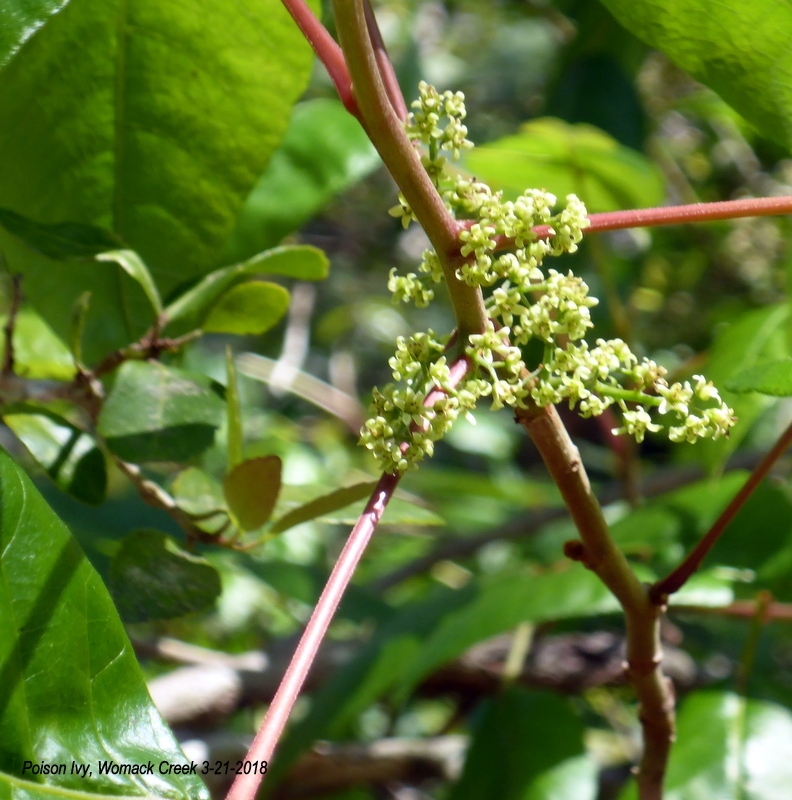 The most common flowering plant on the upper stretch was American holly. Unlike Womack Creek, the New has less diversity and fewer blooming shrubs and plants. The night was much warmer, but a campfire warned off the few mosquitoes for the 4 remaining paddlers. As it was the night before, the sky was without clouds and allowed a growing new moon to illuminate the area. Eight of this year’s paddlers did last year’s paddle. Of the three new paddlers, one had expected to paddle last year, but got sick and could not participate, the other paddler found out too late to join the group. 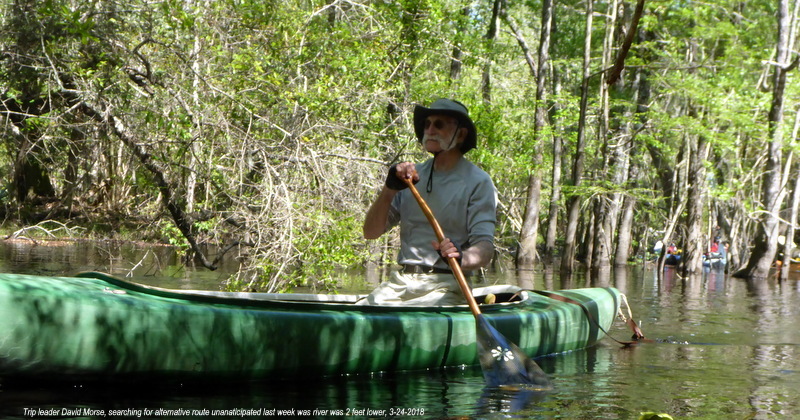 He had paddled this river several years before with the trail club. For two this was the first time on the river. We shall see who will return to try another face of this river next year. We already have the scouting team (4 and the shuttle driver) — the volunteer scouts/bushwackers seem eager to go in 2019, even if there the next annual paddle date has not been set. As one paddler suggested: why not have a scouting paddle and have a pre-scouted paddle. One thing for sure: neither will be the same experience on that river. Interested paddlers with skills beyond basic (to avoid getting caught in strainers in fast water with narrow openings) and stamina to do a 15 mile paddle with uncertain conditions (e.g. portages, scoot-overs, haul-overs) can contact marylyn_feaver@comcast.net. When the announcement for next year’s paddle goes out, you’ll receive it. 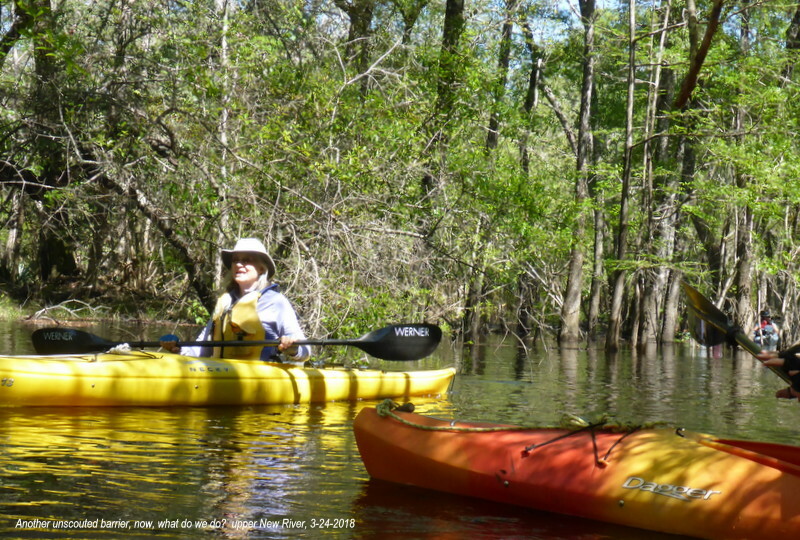 However, membership in the Apalachee Canoe and Kayak Club may be required (a $10 annual fee which is mainly to cover the cost of paddle insurance.) Shared cost in 2017 was $40 (requiring rental of portable toilet , 2 campsites,Pope’s & campsite 17, security for gear and outfitter’s fees). In 2018, with fewer expenses, the shared cost was $20 (outfitter fee, tip, 1 campsite for two nights). 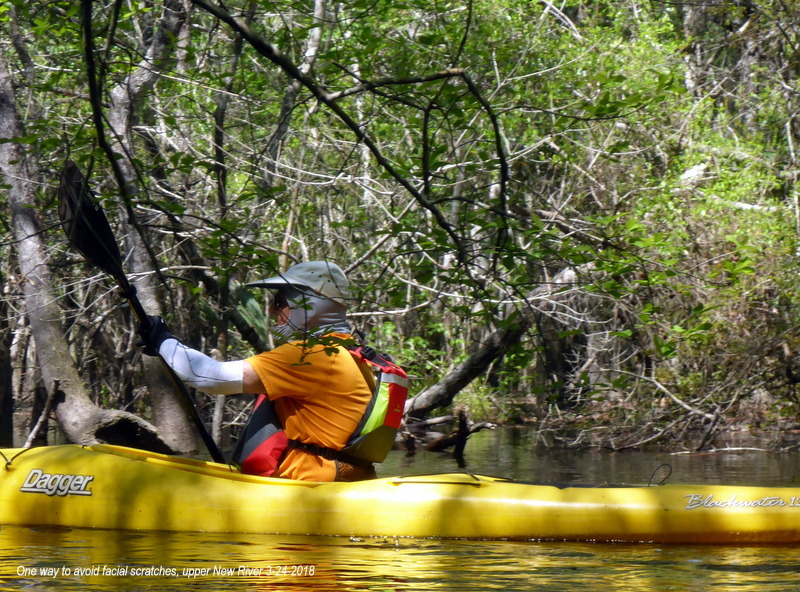 This entry was posted in New River, Paddling Tate's Hell State Forest, Tate's Hell State Forest and tagged New River, Paddling Tate's Hell State Forest, Tate's Hell State Forest on March 25, 2018 by marylynanded. 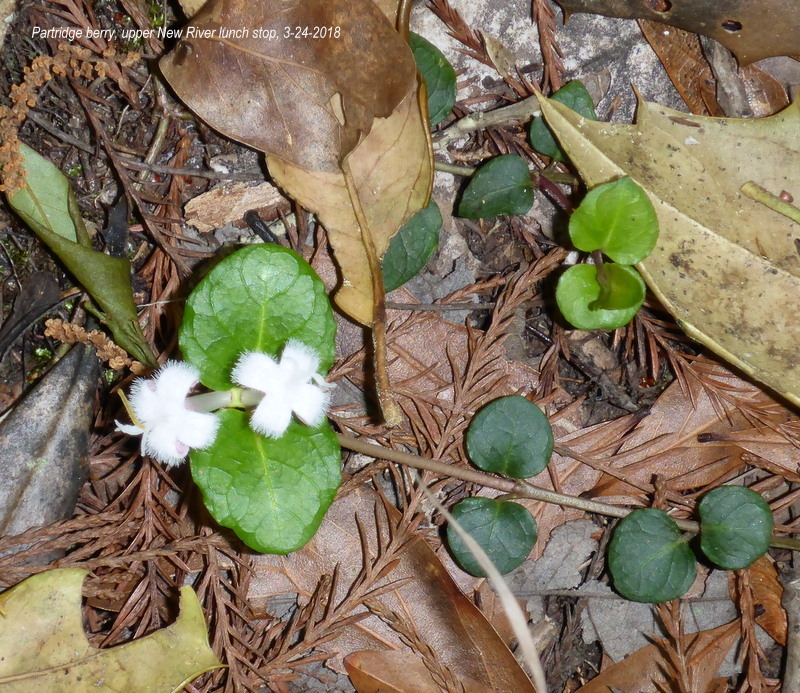 This entry was posted in Florida native wildflowers, Tate's Hell State Forest, Womack Creek and tagged Florida wildflowers, Tate's Hell State Forest, Womack Creek on March 22, 2018 by marylynanded. 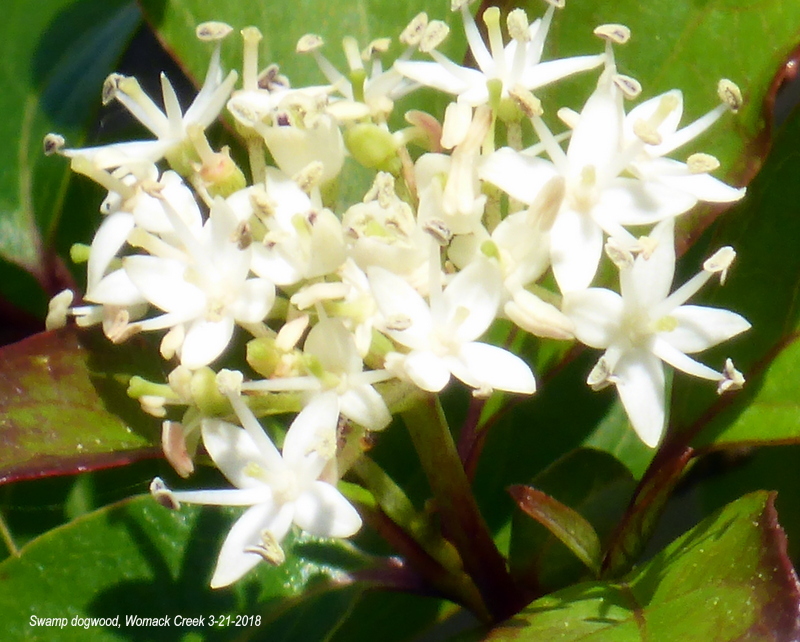 Certain blooms have short duration of blooms — take parsley haw. We saw them all over the creek, just starting to bloom — more buds than fully opened blooms. Eighteen days later, not a single bloom was seen. 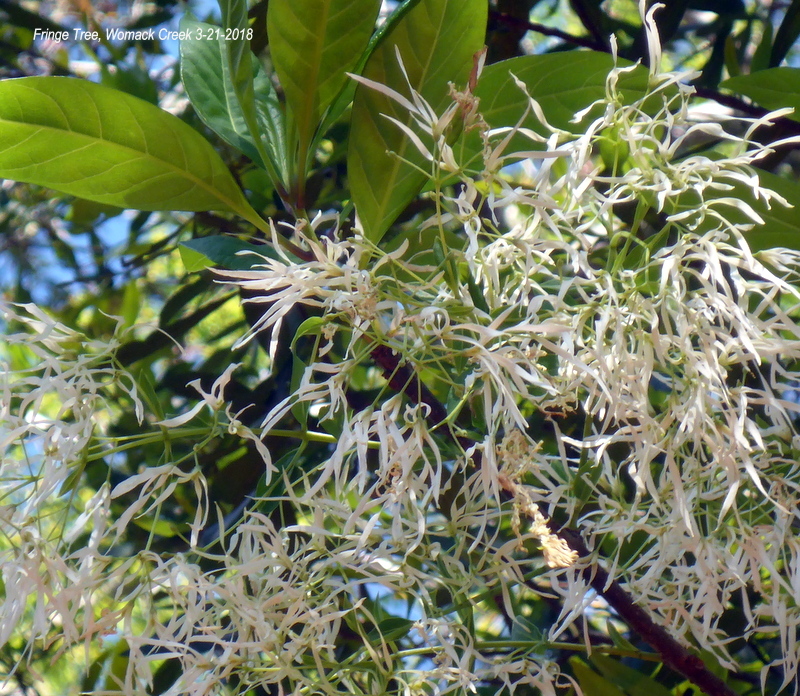 We had missed the peak blooming period for this short tree. 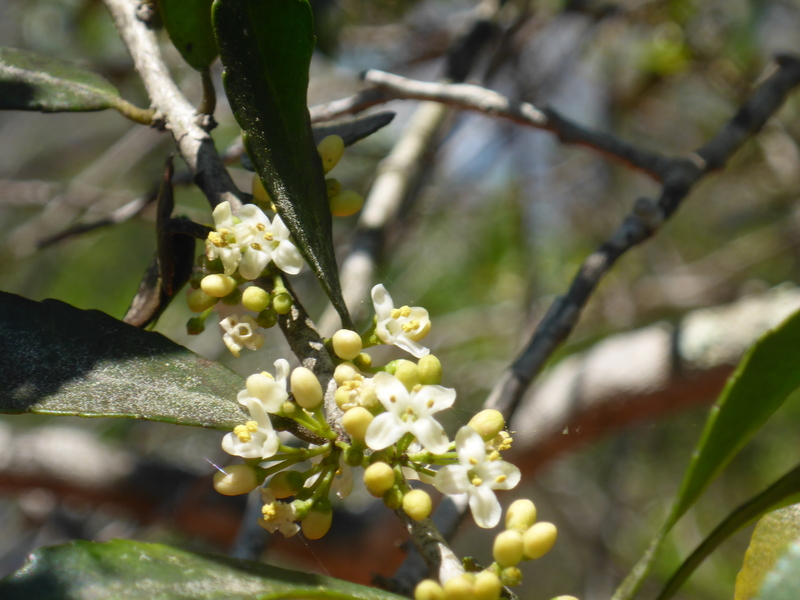 Normally swamp jessamine have a longer duration of bloom — the vines take these blooms high up and wherever there is a spot of sun. They were blooming when we last visited the creek — none to be seen. And blueberry blooms, early bloomer along with the Walter’s viburnum — both are going to seed. And after these, more to come. 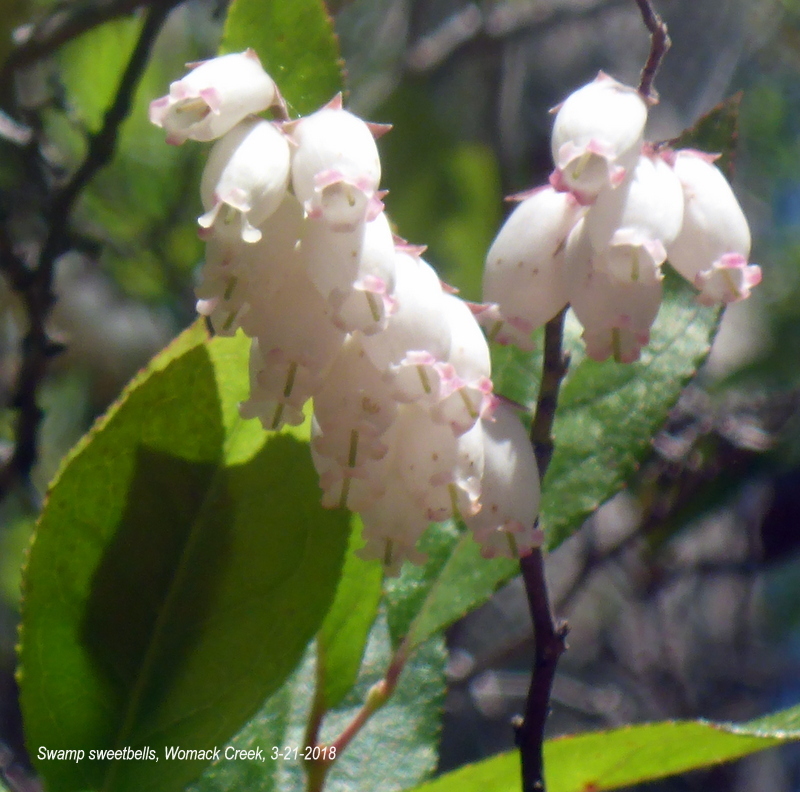 This entry was posted in Florida native wildflowers, Tate's Hell State Forest, Womack Creek and tagged Florida native wildflowers, Tate's Hell State Forest, Womack Creek on March 22, 2018 by marylynanded. A pair of wasps. Is that all that is needed to start a colony? They were busy at work and didn’t fly away. Earlier on a higher branch, last year’s hornet’s nest. Apparently the hornet’s won’t return here, but start again, just as these wasps are starting anew. Further upstream another pair of wasps were busy starting a colony. This entry was posted in Florida insects, Tate's Hell State Forest, Womack Creek and tagged Insects, Tate's Hell State Forest, Womack Creek on March 22, 2018 by marylynanded. We haven’t seen this big gator for awhile. It used to sun on huge tree logs partially submerged in the creek, camouflaged in color and texture until one came upon it. Usually, it detected the paddler first, which resulted in a huge splash. Do alligators recognize difference in boats, paddlers, style of splash? As our trips continued, the big one got less skittish and was less likely to immediately depart into the brown waters. The juveniles are curious — they seem not to be afraid, more curious. One can take good close-up photos and they usually remain in place to be photographed. One doesn’t get too close to big ones — out of respect for their sense of territory (the females have less tolerance on that score than males, apparently) and the danger a sudden immersion into deep water can do to a kayak. This one, this time, waited a long time before it slowly slid into the water. Meanwhile further upstream, a familiar alligator was sunning on a less camouflaged bank, enjoying the sun and allowing one to get closer to photograph it. Since 2012 we have seen more alligators on the creek each year. 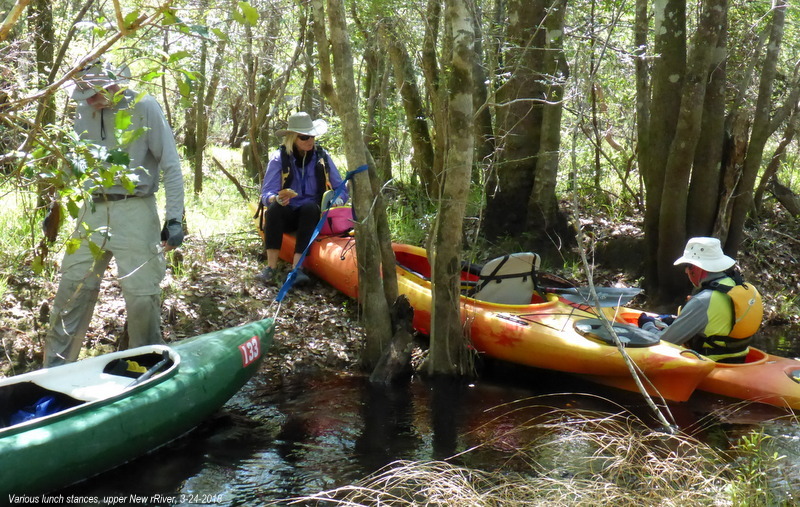 This entry was posted in Florida amphibians, Tate's Hell State Forest, Womack Creek and tagged Florida amphibians, Tate's Hell State Forest, Womack Creek on March 22, 2018 by marylynanded. 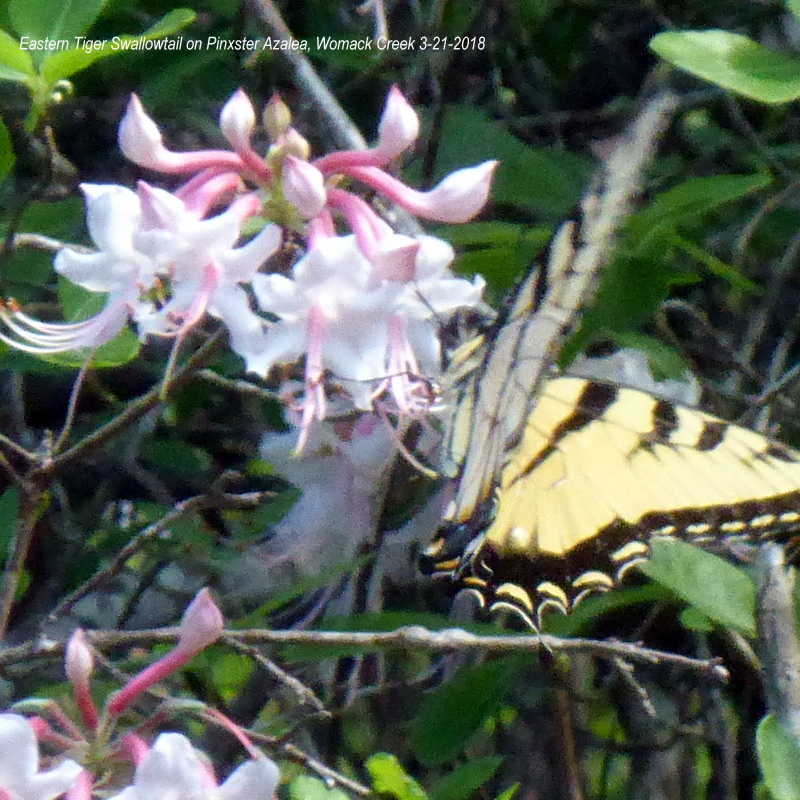 When the Pinxster Blooms, Expect the Swallowtails. It was the day after the official day of Spring, but don’t tell that to the pinxster azaleas. 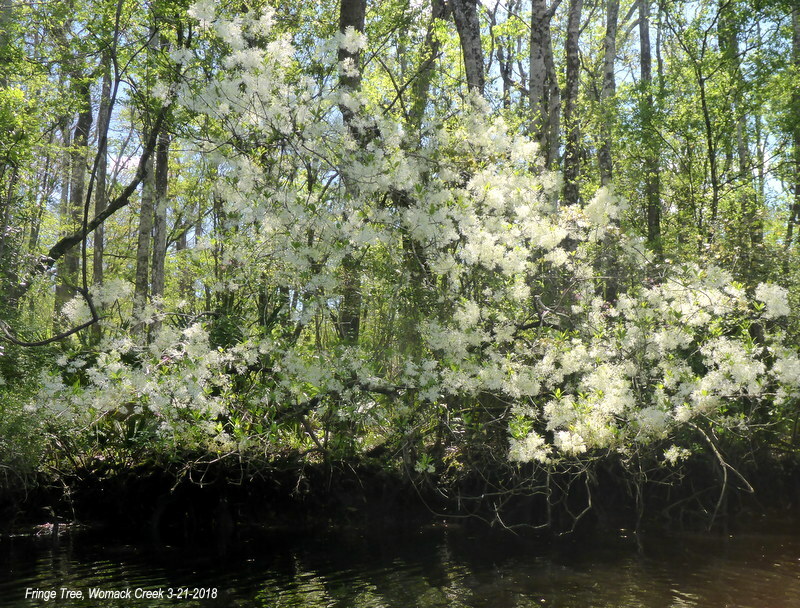 They have been in bloom for several weeks now, but there were more bushes in bloom yesterday when we paddled up Womack Creek battling NE winds of up to 10mph on the Ochlockonee before entering the protected area of Womack creek. 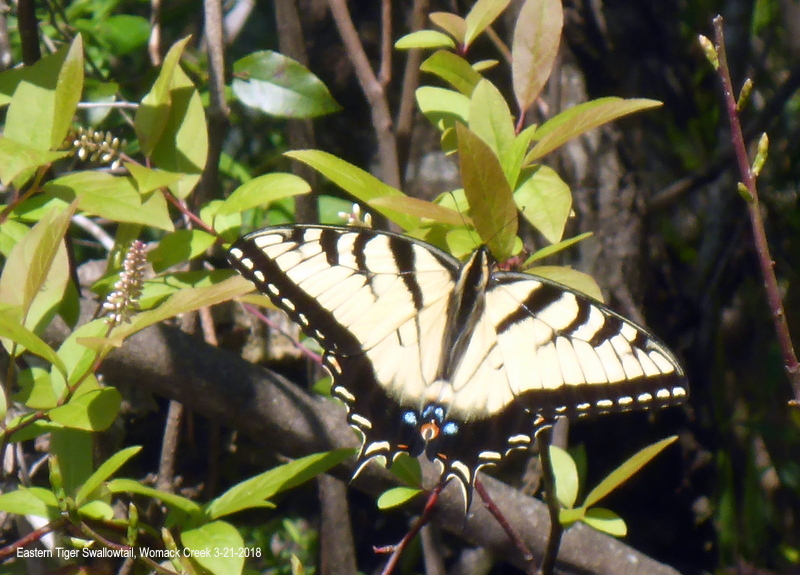 Stereotypical blue sky and cool temperature at 56 at put-in and add to that swallowtails, pinxster azaleas and fringe tree. Womack creek is such a gift of native flowers which offer a changing palate of colors, scents and feeling. Like the waters of the creek, each visit is different. 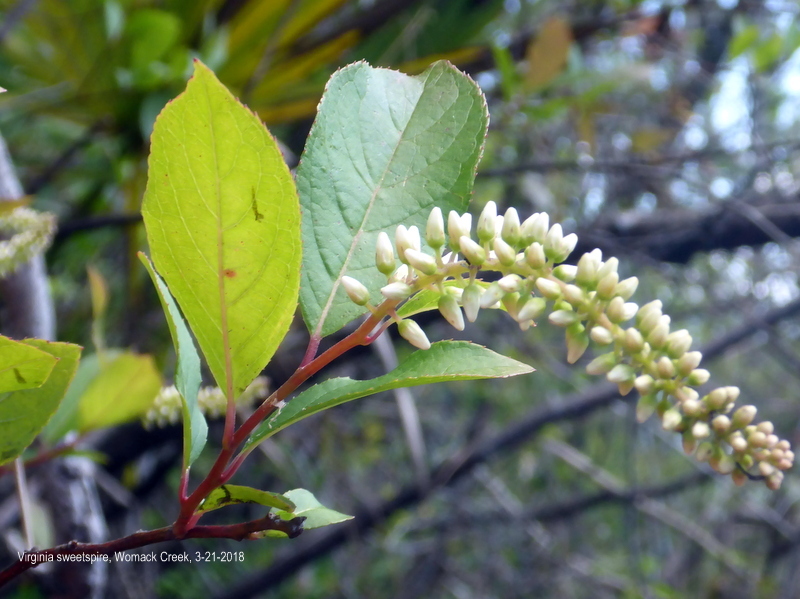 This entry was posted in Native Wildflowers, Paddling Tate's Hell State Forest and tagged Florida native wildflowers, Tate's Hell State Forest on March 22, 2018 by marylynanded.